Zheng Cotton broke through 22,350 yuan on February 7 and continued to make corrections. As of February 17, it has fallen by 3.8%. In the same period, the MA index fell 1.6%. Although the cotton spot price index continued to rise, the increase gradually narrowed. In the State Reserve, the accumulated reserves reached 2.544 million tons, which accounted for 34.85% of the country's annual cotton production, and the market's high-grade cotton resources gradually decreased. The cotton price has declined and it has caused people to think deeply. Loose supply coverage throughout the year. According to the US Department of Agriculture February cotton report, global cotton production was raised to 26.6451 million tons in 2011/2012, an increase of 6.95% from the previous year. From the perspective of China's cotton production over the same period, in 2011/2012, China's cotton production increased to 7,293,800 tons, an increase of 9.84% over the previous year. In order to prevent the cotton price from falling and protect cotton farmers' enthusiasm for cotton-planting, the state started to store storage from September last year, and on February 17th, cumulative storage and storage reached 2.568 million tons, accounting for 35.18% of the annual output. Collection and storage only transfer cotton ownership formally. In the long run, it does not make its supply function disappear. The lack of consumption constitutes a worry. According to the US Department of Agricultureâ€™s Cotton Report, affected by the global financial crisis and the slowdown in economic growth, global cotton consumption in 2011/2012 was reduced to 23.865 million tons, a decrease of 4.03%. Global cotton ending stocks increased to 13,231,100 tons, an increase of 34% from the previous year. The global cotton stocks consumption ratio increased to 55.39%, an increase of 15.72% over the previous year. In 2011/2012, China's cotton consumption was reduced to 9.579 million tons, a decrease of 4.35% from the previous year. National cotton imports increased to 3.7013 million tons, an increase of 41.9% from the previous year. The national cotton ending stocks increased to 3,929,900 tons, an increase of 55.6% over the previous year. The national cotton inventory and consumption ratio increased to 40.98%, an increase of 15.83% over the previous year. From the recent survey of the textile industry, the increase in raw material and labor costs has led to a rise in yarn prices, but the order, sales, and profitability of companies have not changed. The transfer of external orders, the reduction of external demand orders, recruitment difficulties, financing difficulties, slow payment and other issues have plagued businesses. Low price cotton pull the cotton price. As of the 17th, the FCINDEXM index reflecting the arrival of foreign cotton at the port price reached 105.74 cents, a 1% customs price of 17,016 yuan/ton, a discounted quasi tax price of 17,494 yuan/ton, a difference of 2,537 yuan/ton from the inner cotton 328B index. And 2,059 yuan / ton. India's S-6M1% tariff rate is only 16,302 yuan/ton, and the sliding tariff rate is 16,787 yuan/ton. There is a difference of 3,251 yuan/ton and 2,766 yuan/ton from the inner cotton 328B. In the absence of artificial and other costs falling, textile companies are more willing to increase the use of cotton to reduce the overall cost. From the point of view of imports, from 2011/2012 to the present, China's cumulative import of 2 million tons of cotton, an increase of 724,000 tons over the previous year, an increase of 56.7%. Recently, China's business delegation went to the United States, which signed contracts for 220,000 tons of US cotton. In February, China's cotton contract volume should be at a high level. Low prices and increased imports have inhibited the spot price of cotton in the domestic market, and the rebound in cotton prices has been relatively high. The floor strength is different from inside and outside. From the ICE market situation, as of February 17, speculative ** net long rate increased from 8.8% last week to 25.0%; speculative ** net short-term rate fell from 33.1% last week to 17.3%. In contrast to the domestic situation, as of February 17th, although the increase in net positions of the top 20 cotton contracts in the Zhengzhou Futures Cotton Market was greater than the increase in net positions, the gap between the top 20 net-plus and net-to-air ratios was higher than that of the 130,000 hands. More than 110,000 hands, prevailed. Of course, we should also see that the 2011/2012 closing price and the 2012/2013 closing price increase forecast, as well as the expected decline in the cotton acreage this year and the temporary adjustment of domestic macroeconomic policies, may give cotton prices a chance. To support. However, in the short term, with the global economic recovery facing many constraints, China's economic growth rate falling, textile and apparel export growth slowing down, and geopolitics still plagued by many interferences, the cotton price rebounded in the future and the resistance is not small. And it is more likely to wait for policy guidance. Tealight Candles are made with paraffin wax and aluminum. Its shape is round shape and heart shape, the fragrance is various, also can produce the candle that without scent. 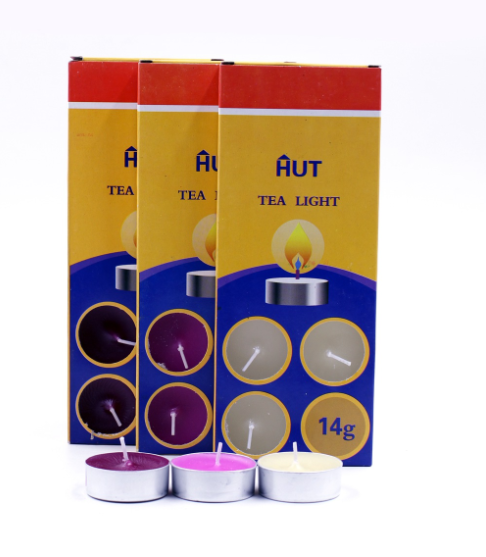 The usually packing of tealight candles are poly bags, craft paper, PVC box, shrink and so on.